What’s this!? Another post? Within the same month as the last? LOL I have a lot to tell, what can I say? Muwahahaha! So, let me tell you what Blogger is doing now. In the past, if you wanted to change your background image on your Blogger blog, you went to one of the beautiful, blog design sites, (see my resource list), and found the image you wanted. They have some awesome packages with a styled background and matching header. And, they are so artistic and adaptable. Once you found the image, you copied a code. Back at your blog, you would go to the ‘Edit Layout’ page, click on ‘Add a Gadget’, select ‘HTML/Java Script’ feature, paste the code and, wallah, instant background of your liking. Simple and so convenient. Right? Well, Blogger is getting in on the designing aspect of their blogs, much more than just a series of templates. Now, they have the new “Design” feature. In addition to having new templates at your fingertips, this allows you to change the fonts, their sizes and colors, and a few other aspects of page design, too. Now, Blogger in Draft, has added a feature to add your own background image or photo, with a click. You can change it daily, if you like. 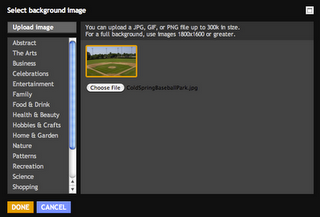 At the top of the list is “Upload Image”. You know the rest. You can adjust the background with another feature, save and you are set. Do remember that, to get to the BID dashboard and features, you have to go in with the ‘Blogger in Draft” link. At least, that is what it looks like to me. It’s worth it to be able to use this function. As far as the blog design sites, their beautiful designs won’t fade away with the advent of this new feature. Rather, I would think, it would give their sites a boost. Now, you can copy only the image link and add it in to the design. I thought it was a lot of red tape, what with having to go with BID. But, it was fun trying. The article on background images at BID is more informative, if you want to give it a read. I have updated my DeviantArt account, adding the pieces that I have been doing for Digital Whisper’s challenges. In addition to the weekly challenges, Kimmie has started a special challenge, Dark Whisper, for those who want to join. The artwork that comes out of the folks in that group is awesome! She is teaching us Color Theory, too, which is something I needed brushing up on. My last class in it was in college, um, a few years back. LOL And, aside from all that, the DW Blog also has weekly challenges. There is always an image that inspires me from these and I have stayed busy! You’ll see if you click on the DA link and go have a look. Check out the DW Blog. See if you are interested. The group is invite only, but, if you e-mail me, I will get one to you. I don’t know what all you can see of the site without being a member, but, the artwork is posted on the main page. The next thing I have for you is a kit that I made a few months ago. It was made for the Daily Download at Magickal Scraps. It was to be a part of the kit we made as a freebie in the store. Well, the store was hacked and it never made it in. So, I offer it to you now. I hope you like. It’s very colorful! LOL Click on the images to go to 4Shared to download. But, never fear! You can’t keep a good design team down. Magickal Scraps is moving! Since the store was hacked, the group has still carried on. I’ve joined them on the Daily Downloads and every month we bring you some of the most awesome designs out there. No, I’m not biased, or anything. LOL Details are still being worked out, so, I’ll have to let you know more later. You can still get the Daily Downloads from the same place as always, until further notice. Right now, we are giving away “Beyond Dreams.” It is featured in the slide show at the top of the page. In case you can’t muster one up, here ya go! Smile on a Stick! Thank you so much for this post. I want to let you know that I posted a link to your blog in CBH Digital Scrapbooking Freebies, under the Kit(s) post on Aug. 05, 2010. Thanks again.